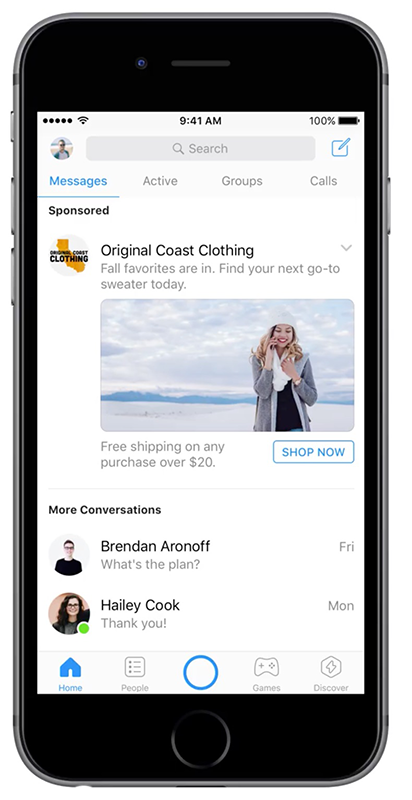 Ads are coming to Facebook Messenger according to an announcement by Facebook on Tuesday. Facebook has been testing ads, within Messenger, in Australia and Thailand in a beta. After a successful test, they will be expanding the beta further. This will be done by offering Messenger ads globally, allowing advertisers to leverage Facebook targeting to extend their reach to people in Messenger. More than 1.2 billion people use Messenger every month, which gives businesses an opportunity to expand the reach of their campaigns to drive more results. The ads will not appear within your individual conversations; people will see Messenger ads in the home tab of their Messenger mobile app. When they tap on an ad, they will be sent to the destination chosen during ads creation. This can be your website or a Messenger conversation. This is how the ads will appear in Messenger. As our attention increases on mobile in apps, this presents yet another opportunity to reach your audience. Often times, Messaging others draws the most of our attention; that’s debatable, but we can’t deny 1.2 billion people per month and another moment in time to reach them. Copyright 2019 © Nivec Corp.